There were lots of smiles captured at New Life School recently, 147 to be exact. Angelica Gabriel, a former long-term volunteer with Living Media International, took photos at the school to start putting together a memory portrait project. These photos will be turned into artistic portraits by students and artists around the world. We were inspired by the organization, Memory Project, which works with art teachers and students to create portraits for kids who face hardships and challenges in their lives. We are excited about this portrait project because it helps students feel valued and also gives them a piece of personal history. Another benefit is that it will broaden other students’ perspective on how kids are living in different parts of the world. This will be a very special gift for the students at New Life School. We will be delivering the portraits to Haiti this coming school year, 2017-2018. And now we’re inviting you to be a part of the project with us! Check out the attached documents and contact us for more information. We would love to connect with you and have your artistic talent inspire and encourage these Haitian students. Thank you! This December we are working towards starting the New Year off right by raising funds for a new group of inspiring young Haitians to receive scholarships through our Dreamer Program so that they may attend university programs and receive professional mentorship and training in the fields they choose. You can learn more about how you can get involved, donate to receive one of our great thank you gifts, and watch a video by our past Dreamers by visiting our Dreamer fundraiser page here. Thank You! And Happy #DreamerDecember! New international attention has been focused on our little land of Haiti again as we work to recover from Hurricane Matthew which bulldozed through the southern part of the country last week leaving a path of destruction behind it. In our community of Mizak, we are looking at the specific challenges that our residents are facing and see how we can adapt our current programming to address the needs that have resulted from the damage of the storm. 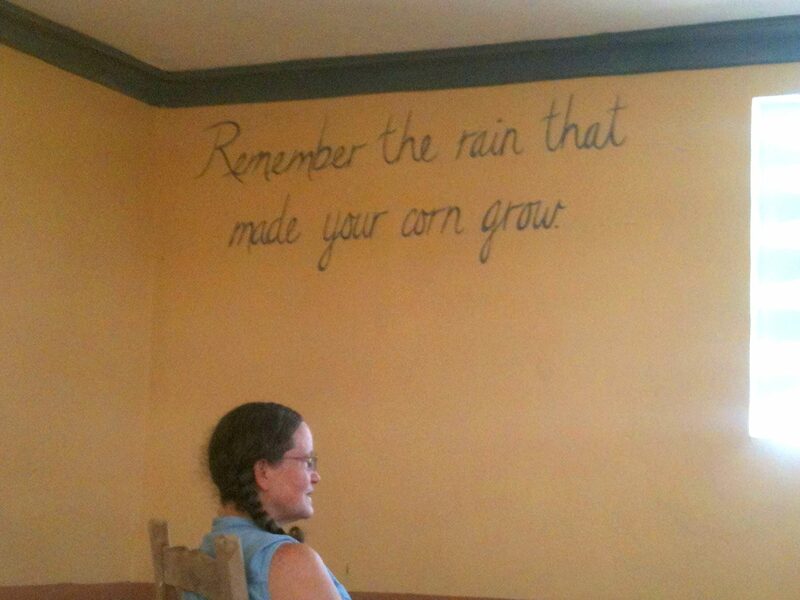 The residents of Mizak all depend on agriculture for their livelihoods, growing crops such as corn, beans, coffee, and fruit to sell in local markets to provide for their families and send their kids to school. When Matthew swept through last week, heavy rains and high winds leveled the fields, uprooted fruit trees, and took the lives of much of the livestock, leaving families with no resources left to earn money with. Without this agricultural income, the burden of paying for their children’s educations is going to be much heavier this year, even impossible for many. That is why in response to the storm, we at Living Media International have chosen to focus on expanding access to our many educational programs within the community to help ease that burden for families who may not know where to turn after the storm. While Living Media is focusing on our education programs, our partner, LaVallee de Demain is working to bring more immediate need to some families in need and to the farmers of our area. During the storm, multiple families actually used the LaVallee de Demain headquarters as an emergency shelter and in the days following there have been four families who have not been able to return to their homes due to the damage that they sustained and they remain living at LaVallee de Demain. The organization is now raising money to be able to help these families repair their houses so that they may return home to live in a safe and dry place. As LaVallee de Demain is an organization that focuses on agricultural and environmental interventions, they will also be providing short term food aid and agricultural help to the farmers in our area that lost their crops and their livestock. To accomplish these projects, they are hoping to raise $4,000. At Living Media, we ask that you would consider making a one time donation to our dedicated partners to help them reach this goal and bring aid to the people that need it most. You can find out more on their website and use the link to donate. Thank you! 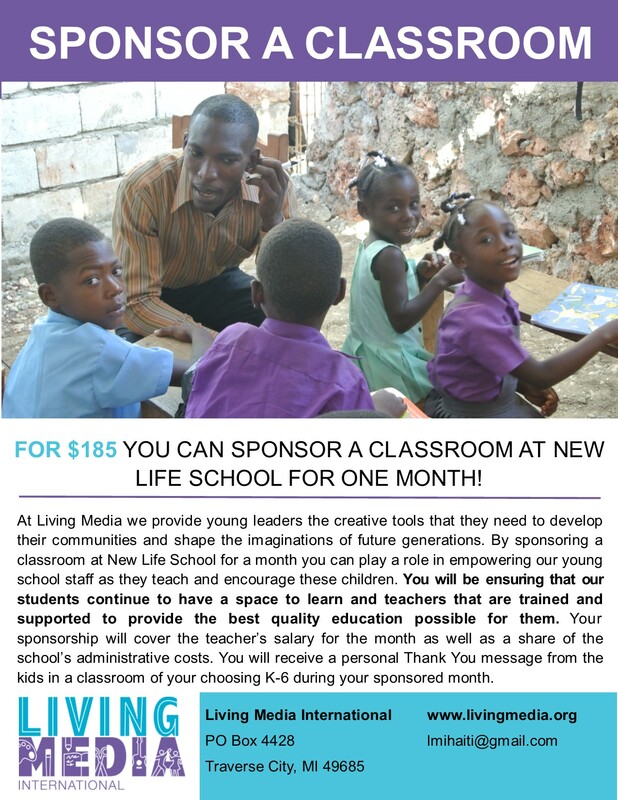 Sponsor a Classroom at New Life! Now that that the children at New Life School have a beautiful building built for them to attend school everyday, we need to make sure that they have all of the support that they need throughout the year to receive the best education possible within that building. So we are looking for groups to partner with us by sponsoring a classroom for just one month anytime during the school year. This could be a classroom of children at an elementary school who collect their spare change for a month and wants to connect with kids their age in Haiti. It could also be a family who decides to pitch in special funds over the holidays to bring special cheer to a group of our students. Or maybe it’s a Bible study group at a church that decides to sponsor a classroom as their special mission project for the year. Whatever the case may be, any group or individual that would like to come alongside our staff in Haiti in providing the support that we need to provide the highest quality education we can to these kids, please know that your partnership would be greatly appreciated! It’s only $185 and during your month you will receive a special thank-you message from the children in the classroom. More details on the flyer below. Please contact us with any questions or more information on how to become a sponsor. Thank you!